St John's Lodge, a villa in Welwyn, Hertfordshire, was commissioned by Mrs Mary St John (unknown dates), formerly Mary Schuyler of Albany, New York. During the American War of Independence she had married a British Naval officer, the Hon. Captain Henry St John (d.1780), the son of John St John, 11th Baron St John of Bletso. In 1775 Captain and Mrs St John purchased land in Hertfordshire, and commissioned designs for a house from Adam. They also owned a house on Park Street, Grosvenor Square in London, and it would appear that St John's Lodge was their country home. The villa was sold in 1824, and in the sale particulars it is possible to see that the fabric was constructed to a modified and enlarged version of Adam's design. 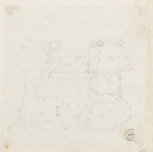 It is likely that Adam was responsible for this altered design - though no drawings survive - as he was later to produce at least one design for the interior of the villa (Adam volume 3/45). The villa was substantially modified in c1920 following a fire, and divided into flats. From 1940 it was used as the Danesbury Hospital and Neurological Centre, and was replaced with a new building in 1993.